After Task 1 finishes, tasks 2a, 2b and 2c all run simultaneously. 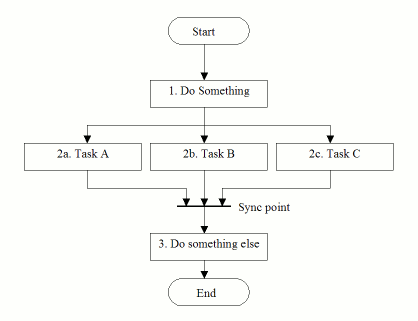 Only when 2a, 2b and 2c all finish (the sync point), can task 3 can run. 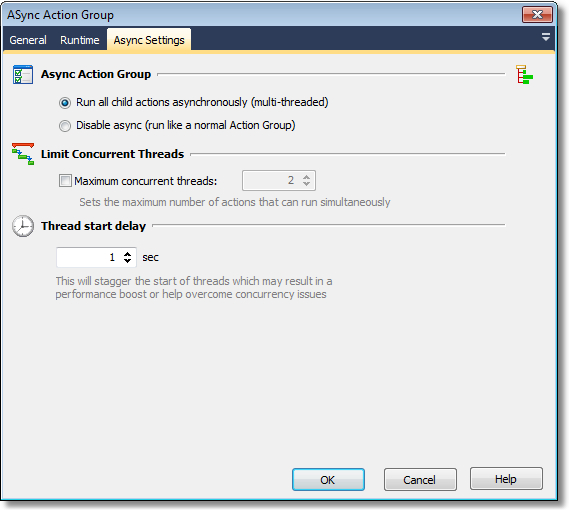 To run actions in parallel use the "ASync Action Group" action (in the Flow Control category). In the screenshot above, Task 1 has already completed and now all 3 of the parallel tasks are running at once. When all the parallel tasks have completed, Task 3 will run. (In the example above, task 2b has 4 sequential child actions. The first and second have completed, and the third is currently running.) Tasks 2a and 2c are running in parallel. You can choose to Disable Async to have the Async Action Group behave like a normal (sequential) action group. This may be useful for debugging purposes, or for running the project on hardware which may not perform faster with multiple actions running simultaneously. Setting a thread start delay allows you to "stagger" the start of the threads, which may give a performance boost or help overcome concurrency issues. Starting from the second child of the Async Action Group, each child will be started the specified number of seconds after the previous async child. If you would like to limit the number of simultaneously running actions, then set the maximum concurrent threads. It must be at least 2, otherwise the Async group will behave like a normal Action Group. • More than one CPU (or more than one CPU core) is available. • "IO bound" actions can be run together with "CPU bound" actions. • Slow network-bound actions, or other non-CPU intensive actions, can be run together with CPU intensive actions. You can even run ASync Action groups inside ASync Action groups. Again, it is recommended that caution is exercised when doing this. • You cannot have any interactive actions which require user input (eg. Prompt for Variables) under Async Action Groups. • Reading and writing the same files. • Reading and writing the same registry values. • Some compilers (such as the Delphi compiler) and some other tools may lock certain files and a second instance may not succeed. • The Visual SourceSafe actions cannot be used under Async group as the actions temporarily modify the SourceSafe INI files.